Join us in our Adoration Chapel 24 hours a day, 7 days a week, 365 days a year! In Eucharistic Adoration we come before Jesus truly present – Body, Blood, Soul, and Divinity! 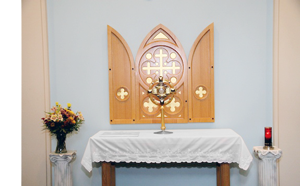 Click on the link below to search and view a directory of online Eucharistic Adoration chapels in the United States.